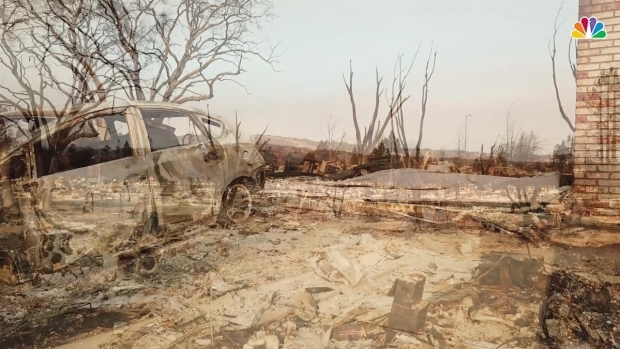 "We want to think this was just a nightmare, but this was a horrible disaster"
Days after a deadly wildfire ravaged Sonoma County, a family sitting at an In-and-Out Burger in Rohnert Park, California, recognized their home from the footage of burned-out buildings playing on a laptop. They had just returned from a visit to their house in Santa Rosa’s Coffey Park neighborhood, a square-mile of middle-class homes and friendly neighbors, which was among the hardest hit in the wildfires that broke out last Sunday. Their two-story house is completely destroyed. They watched NBC Bay Area's footage while eating dinner. The family was emotional as they looked at the charred remains of their home. Monica, a caregiver in Santa Rosa, is a renter who has lived with her family in the house since 2007. She immigrated to the United States from Guanajuato, Mexico, when she was 16 years old has been here for the last 24 years. NBC Bay Area is not using her last name because she is undocumented. Speaking in Spanish, Monica described the harrowing way her family of eight — her mother, brother, husband and son, as well as her sister, brother-in-law and their kids — escaped the flames. They lost pretty much everything. Monica's friend, who was in a wheelchair, died in the fire. The family is currently staying at a shelter in Petaluma. They have no renter’s insurance, and Monica is currently without a job. They have no idea what will happen next. 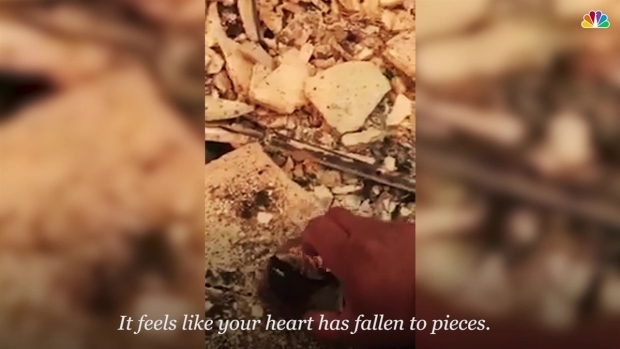 A few days after a deadly wildfire ravaged Sonoma County, NBC Bay Area was at In-In-Out Burger in Rohnert Park, California when a family sitting next to us recognized their home from the footage of burned-out buildings playing on our laptop. Here are some excerpts from our interview with Monica (translated from Spanish), her son and her nephew. NBC: How did you find out about the fire? Monica: We fell asleep at 10 p.m. on Sunday and it started to smell like smoke, but we thought the neighbors were cooking barbeque. The windows were a little open and at 1:30 a.m. they came knocking at our door and started yelling at us to leave because the fire was near. My mom got up and opened the door and the smoke just came pouring into the house and we couldn’t see anything. All the kids ran outside and we didn’t get a chance to grab anything except for simple things on the way out like a sweater. My kids left without shoes, clothes, nothing. My mother began to desperately yell because I wouldn’t come out of the house and I was on the second floor. I was the last one to get out. We just got into our cars and left, but we returned to save the dogs. My mom kept asking me to save the birds, but I couldn’t. It was too late. My brother couldn’t save his motorcycle. Everything burned in the fire. Monica: We left and I didn’t imagine that my house would burn. I left with hope that my house wouldn’t burn down. We waited in a Safeway parking lot, until an officer told us we couldn’t stay there. We then left for a shelter in Petaluma, and that’s where my mom started feeling bad because of her asthma. With all the smoke my mom was really affected, and she didn’t get a chance to grab her medicine. NBC: Were you able to save anything in the fire? Monica: We lost everything. We didn’t get a chance to grab anything. I feel so grateful to God that at least he kept us alive. I had just bought my kids a new Apple computer, because they’re teenagers who need it for school projects and it’s gone in the fire. The material things don’t bother me as much, but the memories of so many years that I had of my kids, photos, everything, it’s gone. The material stuff can always be replaced, but not our lives. NBC: Do you have renter’s insurance? Monica: We didn’t have renter’s insurance. No one ever offered renter’s insurance to us and I didn’t know I needed it. Now that this happened they told me that I didn’t have insurance so they’re not going to pay for anything that I had in my home. It affected us a lot, but I thank God for keeping us alive and that we’re all united and we need to keep pushing forward. NBC: Do you know where you’re going next? Monica: Right now I don’t have work, I’m a caregiver, and the people I take care of were evacuated because of the fires. My husband’s the only one working right now. The Santa Rosa Red Cross helped us a lot, they gave us food and clothing. They also helped us fill out paperwork for a home. I’m really thankful for all the help. We’re on the waitlist for a home. They have given us three rooms for now. We’re not sure for how long we’ll be able to stay in Petaluma – could be one week or even two. But it has affected us greatly. We want to think this was just a nightmare, but this was a horrible disaster. NBC: Have you gone back to Coffey Park? Deadly wildfires in Napa and Sonoma counties sent residents fleeing for their lives and reduced dozens of homes to smoldering ash. Monica: We’re from Guanajuato, Mexico. I’m neither a citizen nor a resident. My kids are the only ones who are citizens. But my mom, my husband and I are not. I couldn’t apply for DACA for a year, but it's cost me a lot. I came when I was 16, so I’ve been here 24 years. I graduated from Monte High School in Los Angeles, and then Rio Ondo College and later Santa Rosa College for a nursing degree. I’ve made my whole life here. It’s very difficult. But with faith in God he’ll help us push forward for our kids - they’re the future. 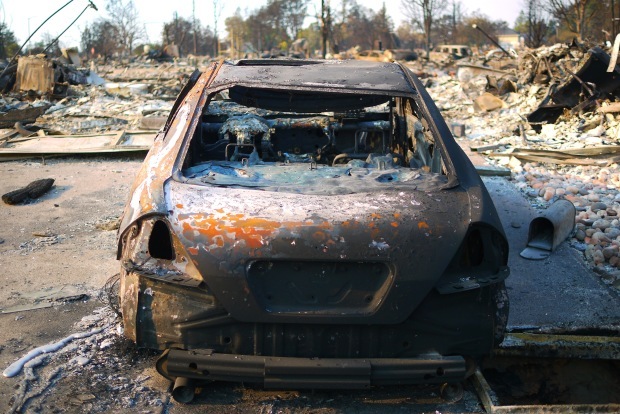 Hundreds of homes in the Coffey Park neighborhood in Santa Rosa, California were destroyed by the Tubbs Fire on October 11, 2017. Excerpts of our interview with Monica’s son, Bradley, 15, and nephew, Kenny, 16. Bradley: I grabbed a shirt, some pants and a sweater, and ran out. Kenny: I went downstairs to grab my dog and we ran to the car. When we opened the door a strong breeze of wind with smoke came into the house and slammed the door against the wall. My aunt couldn’t even see anything on the floor because the smoke was covering the whole house, so we closed the door. We ran to the car and waited for my aunt as she gathered important papers that we needed. It was a scary moment, we just didn’t know what was going to happen. We didn’t even think it would be that terrible, most of our neighborhood burned down and we didn’t think that would happen. NBC: Where did you go next? Kenny: After we took off we didn't know where to go, we went to Petaluma because over here in Rohnert Park you could smell the smoke and see ashes. So we thought it would be better to go further south. When we got to Petaluma, a woman told us there was a shelter and they provided a lot for us: water, blankets and food. And that’s what we did that day, we stayed at the shelter. NBC:Have you gone back to Coffey Park? 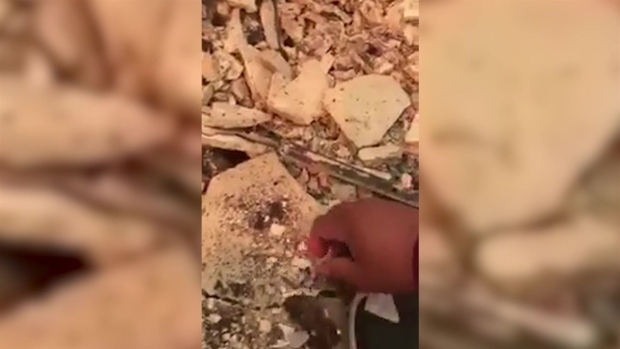 One day after a family living in Coffey Park lost their house in the wildfires, some of the family members returned to see what was left of their house. Here's how one of them described what they saw: 'My stomach just dropped when I saw the house. 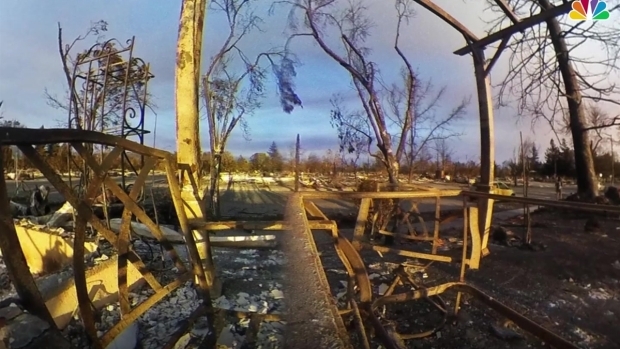 It was just burned to the ground … Everything was just gone. We couldn’t find anything." Stuff was still on fire and everything was still hot. We had to go back the next day. We lost everything. I didn’t even grab my phone. I didn’t even think about my phone at that moment, I grabbed my dog and got out. But everyone got out safely. NBC: What did you have in your room? Bradley: I had my XBox, my TV and my bed. NBC: Do you know if your neighbors and friends are safe? Kenny: One of my aunt’s friends died in the fire. She was in a wheelchair, she couldn’t get out the house. Bradley: One of my friends, his house actually survived, we take him to school every morning and he was one of the lucky ones. It was like 12 houses out of 500 that got burned survived. It was kind of cool - there was this one man who actually put the fire out on his house, and he stopped the fire from reaching other houses.